Problems with driver’s licenses helped send a former Illinois governor to prison. Illinoisans tend to be pretty jaded about this sort of thing. A governor going to prison scarcely raises an eyebrow. Neither do bad decisions from public officials. When they whip themselves up to do something foolish, it has to be really over the top to merit attention, like giving driver’s licenses to illegal immigrants. Illinois is home to one of the nation’s largest sanctuary cities, so the illegal immigrant driver’s license idea is no big surprise. When legislators concocted the Illinois Dream Act, an early draft included a provision to allow beneficiaries to drive. With a supermajority of fools in Springfield on track to make more bad decisions than ever, what better time than now to legislate putting illegal immigrants on the highways? Illinois is not special. California boasts a few sanctuary cities of its own and plans to put up to 450,000 illegal immigrants on its roads.¹ This is probably a better deal for illegals in California than in Illinois. If they cause a serious accident or kill someone, the border is a whole lot closer. Having given up trying to find good reasons to give driver’s licenses to illegal immigrants, here are five really bad reasons that politicians will, no doubt, rush to embrace. Bad Reason 1: Sanctuary cities need the tax dollars. If we allow illegal immigrants to stay, they need to work. California’s law applies to lucky DACA winners, but given the financial problems the state shares with Illinois, this could turn out to be one of those foot in the door bills. Sanctuary cities like Chicago, Los Angeles, and San Francisco need tax dollars and tax dollars don’t care where they come from. If you are illegal and can drive, you stand a better chance of finding work and paying state and federal taxes thanks to that phony Social Security number you bought and forgot to mention when you applied for your driver’s license. No wonder broke Illinois wants its illegals to drive. At least the state plans to make sure the licenses can’t be used as proof of identity, which shouldn’t pose a problem. Illegal immigrants have other documents for that. Bad Reason 2: Illegal immigrants who want to drive should be insured. Sure. And if they want to work, they should apply for citizenship or a green card and get a valid Social Security number. If I were an illegal immigrant, here’s what I would do. I would get a driver’s license with my phony ID, buy an insurance policy, pay one month, and never pay again. Since I never complied with any other laws, why bother with auto insurance? If someone gets hurt, I can always go back home. Bad Reason 3: States should have the flexibility to make their own pro-illegal immigration laws. When it comes to immigration status, the federal don’t ask policy only applies to laws that infringe on illegal immigrants. To be safe from the Department of Justice, states wishing to take immigration law into their own hands need to remember one thing: they need to make life better for illegal immigrants. Just ask Alabama and South Carolina what happened when they erred on the side of enforcement. Bad Reason 4: Washington will like us if we do this. Democratic Washington may smile on state initiatives to keep the illegal immigrant population happy, but there are still a few responsible voices taking the side of American citizens. A responsible congressman in California? The state never fails to surprise. Bad Reason 5: Latino voters will vote for us if we do this. Latino voters are citizens or they shouldn’t be voting. If their loyalties lie across some other country’s border, what does that say about politicians who are falling over themselves to keep Latinos happy? UPDATE May 21, 2016: Illinois just came up with another reason not to give driver’s licenses to illegals, this time in the form of a motor voter law passed by the state senate last week as reported by The News-Gazette. The big question is how motivated local election boards will be in parts of Chicago with large illegal immigrant populations to screen out those who shouldn’t be voting. That won’t happen, you say? Of course not. Dead people can’t vote, either. Bad Reason 6: Illegals with a DUI conviction should keep driving. I was shocked to find out that there is nothing to prohibit an illegal immigrant with a DUI conviction from getting a TVDL, a temporary driver’s license in Illinois. According to the Secretary of State’s TVDL brochure, an “administrative hearing to seek reinstatement”3 is required, but there is no mention of a ban on securing a license. Since driving under the influence is one of the crimes on Homeland Security’s Declined Detainer Report and Chicago is a sanctuary city, we should have assumed that there would be a workaround. The good news is that DUI is one of the least serious crimes on DHS’ monthly report. The bad news is that undocumented immigrants convicted of more serious offenses can walk the streets. U.S. Immigration and Customs Enforcement reports that for Fiscal Year 2017 8,170 detainers were refused by local law enforcement.4 That means illegal immigrants are released into the community instead of being handed over to federal authorities. Don’t ask, don’t tell is a hazy area when it comes to drivers licenses for the undocumented. 62,517 ICE arrests in 2017 were for immigration law violations, but states like Illinois assure applicants that immigration status is not taken into account when they apply for their TVDL. Now that Illinois is also a sanctuary state thanks to the TRUST Act, will it be handing over applicants because they violated federal law? It must have been one of those very bad “aha” moments when the numbers were checked, rechecked, and Texas officialdom realized they had a problem with their voter registration rolls. 95,000 problems to be exact, as Townhall5 and practically every news agency in the nation just finished reporting. Texas doesn’t issue driver’s licenses to illegals. We also have online voter registration. That seems like a bad thing to have in a state where sanctuary-loving Democrats run the show, something Texas is lucky to not have to submit to, or at least not yet. The good news is that we won’t have that kind of “aha” moment over bad voter registrations in Illinois. We are too fond of our illegals to not look the other way and give them that voice in our affairs that Democrats no doubt believe they richly deserve. ICE chose National Crime Victims’ Rights Week to issue its VOICE Most Wanted fugitives list yesterday. In contrast to the noble migrant myth endorsed by Democrats, the examples in ICE’s announcement are a sad testament to the damage done to real people by real illegals. Kicking off the most wanted list is a case of vehicular homicide in Cook County, Illinois by an illegal immigrant whose ICE detainer was ignored. 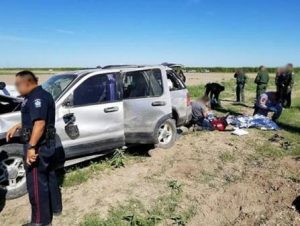 This is what happens when liberal policies protect illegals from the law. States that issue driver’s licenses to illegal immigrants and refuse to work with federal authorities signal their willingness to tolerate these kinds of crimes. Democrats across the nation and on Capitol Hill place political demands over public safety. The crisis at the Southern Border speaks to their success. So do the tragic examples on ICE’s victims list. Yes, the GOP seems to be headed in that direction, Joshua. I think the idea appeals as a concept, but I don’t see how the administrative end would be workable. Both parties talk about background checks and about paying back taxes. How would an immigration overhaul be possible without across-the-board forgiveness for identity fraud? How would you begin to tally up a tax bill? They also talk about going to the back of the line. What does that mean? Waiting outside of our borders or life as usual? Given current immigration enforcement policy, even if a bill was passed, would there be any incentive to participate if you knew you would not be removed? The figures on educational attainment and earnings potential for the millions of illegal immigrants that come from Mexico point to further straining public services if they were to be given legal status. The Obamacare Medicaid rolls would also grow. States like Illinois and California with large illegal immigrant populations already have budget crises to deal with. Another jobs report comes out next Friday, which like its predecessors will likely show no change in the number of long-term unemployed. We should focus on bringing those numbers down first. What do you think? With quite a number of republicans flip-flopping on immigration policy, it certainly seems we are headed in this direction. What do you believe will be some repercussions pertaining to an immigration overhaul?